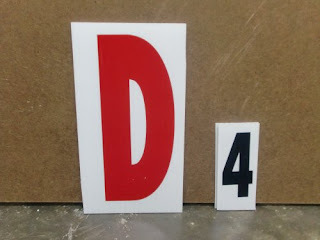 These white letters are available on the 4 ft by 6 ft signs now, but they will soon be available on a new banner system. The banner system will support 4, 8, 12 & 16 changeable letters on the same banner. There is an unlimited variety of colors available, and the banners and letter panels will come in 10 different colors. Many customizing options available. Let me know if interested. New Fluorescent Magnet Signs Coming Soon!